The direct premiums written in the Online Insurance Distribution amount to US$191,951m in 2019. The direct premiums written are expected to show an annual growth rate (CAGR 2019-2022) of 16.6% resulting in a market volume of US$304,068m by 2022. The market's largest segment is Property & Casualty with a market volume of US$111,955m in 2019. In the Life & Health segment segment, the number of policies sold online is expected to amount to 52.8m by 2022. InsurTech is short for ‘Insurance Technology’, a set of innovative business models that disrupt the existing landscape by applying the latest technologies to existing insurance products and creating completely new ways to provide insurance coverage to private customers and businesses. Digital innovations in various forms, including automated underwriting, on-demand insurance services, Internet of Things and big data create new customer experience in all areas of insurance. The benefits of the digitization process of insurance services include: simplified access for end users via the Internet or mobile apps, reduction in costs, a stronger focus on buying experience and customer service and cost optimization for the insurer. The InsurTech market is currently dominated by non-life companies that focus primarily on distribution, and we expect seeing a significant shift to online channels in few years. Given the fact that insurance expenditures are often seen as a financial burden and the process of shopping for insurance can be time-consuming and not particularly amusing, there is a high potential in transferring the entire buying process to the Internet and delivering a quick and accurate underwriting experience. The "InsurTech Online Distribution" market relates to digital insurance distribution to private customers. Included are personal and/or individual policies in life, health, motor, property and liability insurance sold directly to the customer via direct online channels, such as insurance company website or an aggregator plattform. Prerequisite is that the customer has completed the entire application or enrollment process online before the policy is issued. All financial information refers to the potential direct premiums written for policies sold online in the respective products groups. Both new policies and renewal of policies once purchased online are included in the total direct premiums written calculation. The following are not included in the current market definition: agency commissions via metasearch engines, any types of commercial or collective insurance and complementary services such as insurance advisory. Policies sold over other direct channels, such as call center or via e-mail, are not considered and the policies sold offline by an agent of company employee to a customer after he or she has requested a quote online are not included. 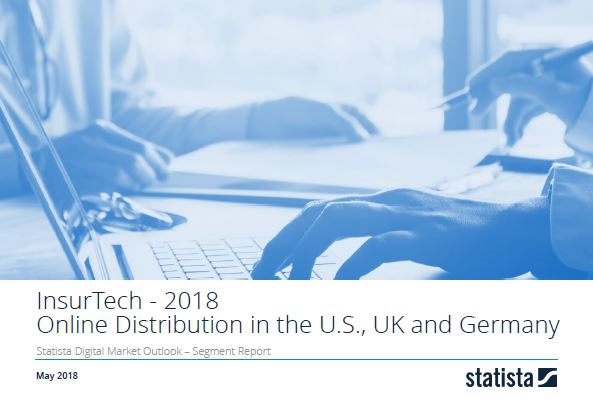 Reading Support Direct Premiums Written in the Special InsurTech: Online Distribution segment amounts to US$191,951m in 2019. Reading Support The Life & Health segment is expected to show a direct premiums growth of 18.1% in 2020. The "Direct Premiums Written" box shows the forecasted value of direct premiums written for the insurance policies sold via the online direct channel in the selected market (market segment, region) for each year. The figures do not refer to the overall revenue that is generated by the insurance companies. The "Direct Premiums Growth" box shows the year-over-year development of the direct premiums written for the policies of the selected type (market segment, region) sold online in percentage terms. Reading Support In the Life & Health segment, the number of policies sold online is expected to amount to 52.8m by 2022. The “Policies in force” box shows the number of policies in force sold online for the selected type (market segment, region) in millions for each year. Reading Support The average premium paid per policy in the Life & Health segment amounts to US$2,192 in 2019. The box shows the average premium paid per policy of the selected type (market segment, region) for each year. Here you can find more studies and statistics about "Special InsurTech: Online Distribution".